(Bloomberg) -- The euro’s stagnant start to the year might be ending as signs emerge that Europe’s economic growth is reviving. Traders are unwinding bets against the common currency in the options market, with a gauge of sentiment and positioning over one year now the least negative in 11 months. Europe’s recovering economy, coupled with optimism surrounding China’s trade, will help push the euro more than 4 percent higher in coming months, according to UBS Group AG and Morgan Stanley. The euro has lost ground against the dollar this year and been stuck in a $1.12-$1.14 range in recent months, on fears of a recession in Germany and a dovish turn by the European Central Bank. That has undermined the forecasts of analysts who were predicting at the start of the year the common currency would gain as policy makers removed crisis-era stimulus. He sees the region’s recovering data, such as retail sales and industrial production, as overshadowing ECB President Mario Draghi’s subdued rhetoric last week. The Swiss bank predicts the currency will gain to $1.18 in coming months and then end the year at $1.20. The currency traded around $1.13 on Monday, having dropped 1.4 percent this year. The euro has still shown a degree of resilience in the face of Draghi’s warning that the region faced a number of risks, from Brexit to trade protectionism. Morgan Stanley is just as bullish as UBS. This week’s German ZEW figures and the flash estimate for the euro-zone Purchasing Managers Index may provide the first indications of an improvement in China filtering through to Europe, said strategists including Hans Redeker. “Optimism on growth in the rest of the world rebounding should weaken the dollar and help the euro,” Redeker said. “We like buying euro-dollar this week,” he said, adding the U.S. bank is also targeting $1.18. That is a level last touched in September. 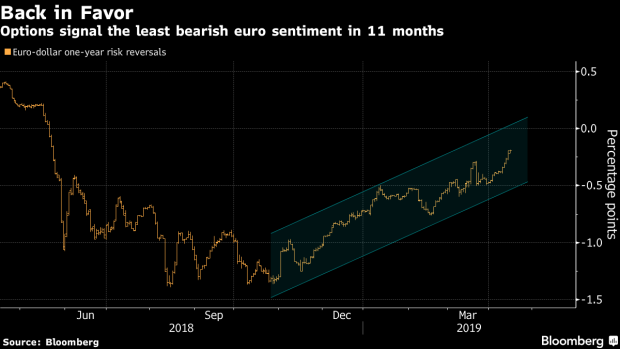 While the options market is still bearish, with one-year risk reversals at about 20 basis points in favor of euro puts, sentiment has climbed this month to the highest since before the risk of a populist Italian coalition rattled European markets last May. On technical charts, the currency would need to close above its 55-daily moving average at $1.1315 for traders to target a March high of $1.1448. Nordea Bank Abp sees it breaking through that to hit $1.1650 within three months.